Yep, Christmas is over, but I'm still indulging! We had friends over last night and we just sat around and ate and ate and ate some more! Ugh. After New Year's is over, I HAVE to get back to the gym. 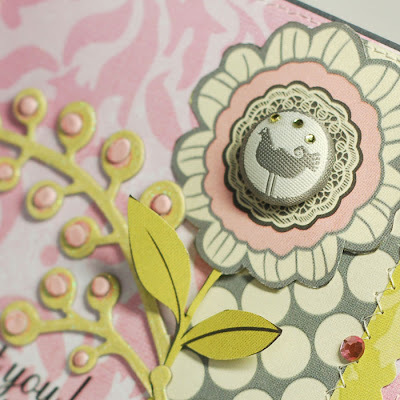 Just a couple of cards to share today...This one was done for Emma's last week. I used Scenic Route and My Mind's Eye papers. The little bird is My Mind's Eye and the stickers are Making Memories. I love the chipboard. It's SEI. This card is based on CPS sketch 96. I'm a little late, but oh well. 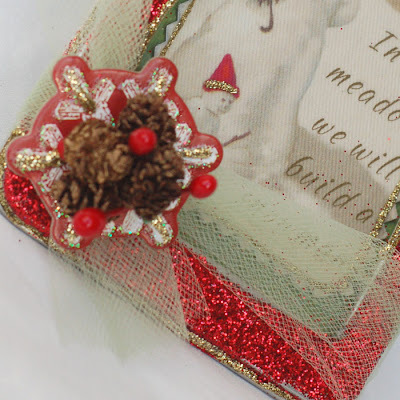 I used Sassafrass Lass papers, MM die cuts, K and Co. brads and Prima felt. The rubon is Fancy Pants. You can see the rest of it and instructions here. Hope everyone had a great Christmas! I ate so much yesterday and indulged in lots of goodies. I was in a food coma by 6pm! Good thing I didn't get out of sweats all day. 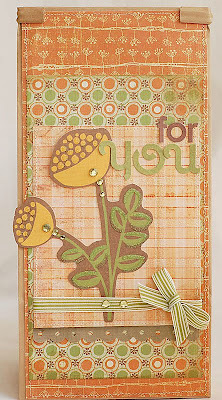 Just popping on really quickly to post my 2S4Y card for the week. 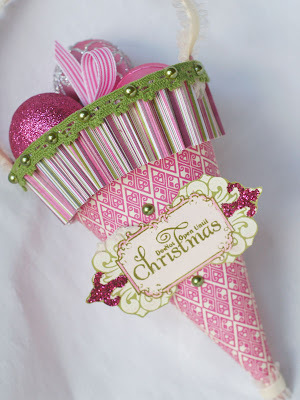 I used Jenni Bolwin and Creative Imaginations papers along with MME chipboard, K and Co. flowers and Prima brads. The stamp is Making Memories. 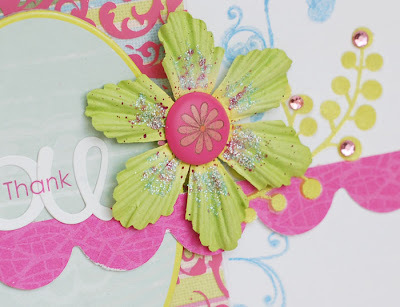 Here is a frame I did a little while back for the Pink Paislee blog. I have it sitting out in my foyer. 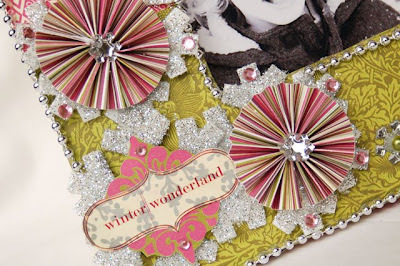 I just love the colors in the Tinsel Town line. Hope you're all enjoying some time with your families. Thanks for stopping by! 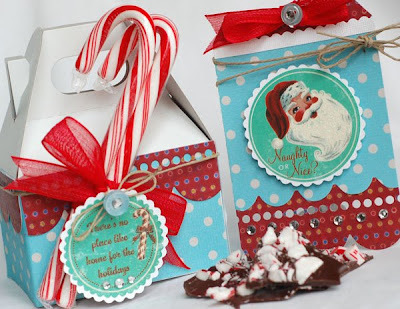 The shopping is done, the gifts are wrapped, the plans have been made and the crafts have been completed. Now, I want to stop and reflect upon the reason for the season. One of my favorite scripture passages is John 3:16 "For God so loved the world that he gave his only Son, so that everyone who believes in him may not perish but may have eternal life. ..." This is what it's all about. 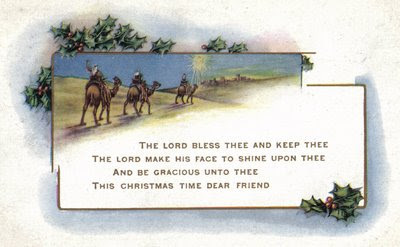 May the Lord bless you on this most wonderful day. May He fill your heart with love and bring peace to you this coming year. Only 3 more days! I'm still managing to keep my sanity. I think trying to keep it simple has been really helpful. 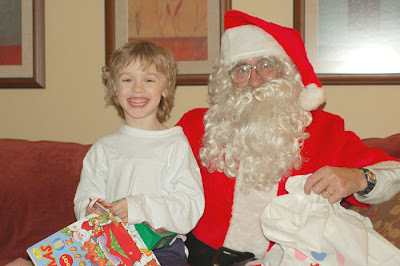 Focusing on some hand made gifts and enjoying Ryan's events at school has really kept the spirit of the season for me. This weekend we went to see Babes in Toyland at a local children's theater. It was wonderful. Ryan really enjoyed it. We will certainly be back there for other performances. 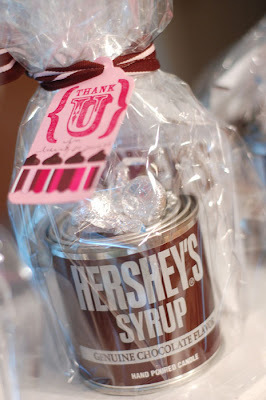 Last weekend we visited Hershey, PA for their Christmas celebration. It was awesome! DH picked up these candles for gifts for his co-workers. I wrapped them up with some kisses and a pack of hot chocolate. Can I tell you how good these smelled?? 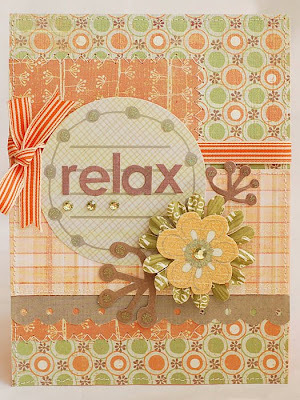 The tag is done with a Stampin Up stamp, Sweet and Sassy Stamps border and some old Paper Salon paper. They were quick and fun to do. 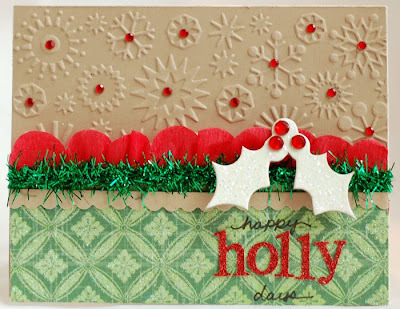 Here is one of the last Christmas cards I've made. I actually dreamed about that sentiment. Isn't that wierd?? I dream about making cards! 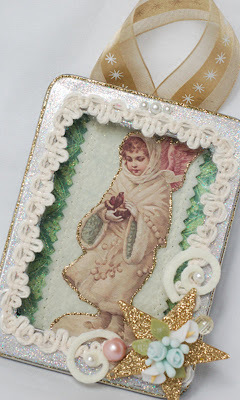 I used a Cuttlebug embossing folder, rhinestones, K and Co. paper and a Melissa Frances glittered chipboard piece. Thanks for stopping by. Hope all of your holiday preparations are going smoothly. Happy Hannukah to all of my Jewish friends!!! Well, craft day at school was a huge success! Twenty three houses have been made and wrapped up to go home. Twenty three mice ornaments, reindeer ornaments and foam picture frames will be going home, too. All of the work and prep were worth it. The kids had a great time! 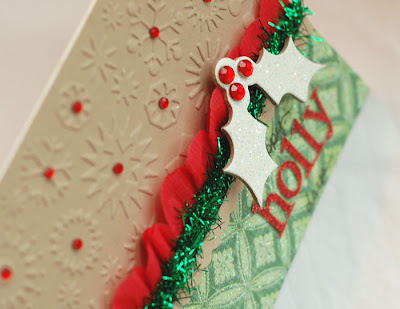 I took a little break from Christmas preparations today to do a card. 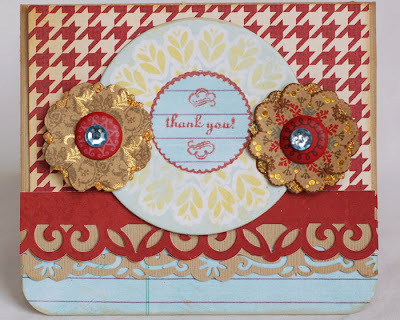 I have been wanting to pull out my Amy Butler K and Company stuff for a while and finally got to use them. 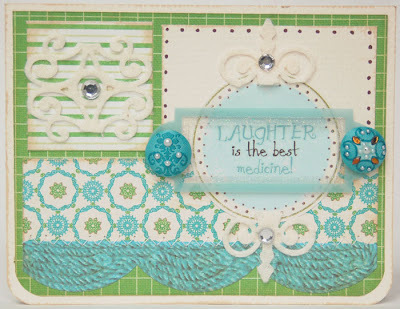 I made this card based on Laura's sketch 15 at 2 Sketches 4 You. Tomorrow is the concert at school. Ryan is sooo excited. I can't wait. Pre-school was really great, but I'm loving all of the elementary school rituals so far this year. We're going to be those dorky parents sitting there with the camera, camcorder and Grandma waving at our little cherub on the stage. Haa haa! Things are getting quite hectic! 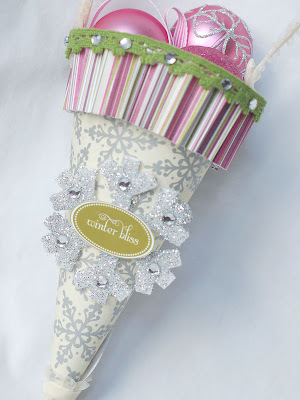 I'm planning a big craft day in Ryan's classroom, so that is taking up a lot of my time. My girlfriend and I prepped 27 milk carton gingerbread houses that the kids will be decorating. That, and about 5 trips to AC Moore has me pretty tired. I supposed Strep and a sinus infection have something to do with it. 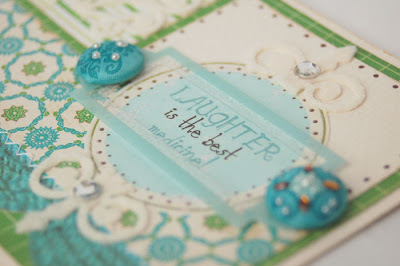 I posted a fun project at the MMM blog today. Here is the sneak peek. Here is the project I did this week for Emma's. 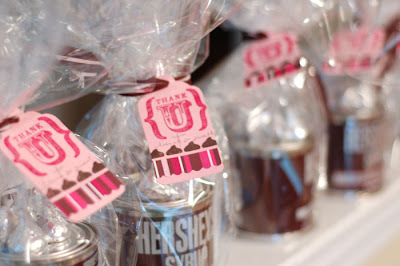 I made this little gift set to hold some candy that I'll give one of Ryan's teachers. We FINALLY have some sun here! Feels like it has been raining forever. Today is Friday and I'm gearing up for a fun weekend ahead. Thought I'd end the week with a couple of Pink Paislee projects that I've done recently. These ornaments were done for a Christmas Tree fundraiser. The team all created an ornament and we sent them off. The tree was filled with Pink Paislee and it was raffled off. The proceeds benefitted a children's organization. 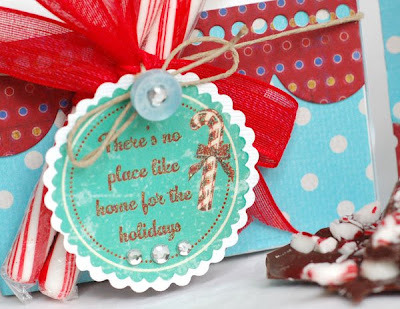 I used the Tinsel Town line. I think this is my favorite Christmas line out there right now. Here is a layout I did of my mom and Ryan. I asked them what they love about each other and recorded it on the page. I used the Sweet Cakes line for this one. It's so bright and fun. Perfect for a page about 2 of my most favorite people on Earth. The yello paper is from Vintage Moon. 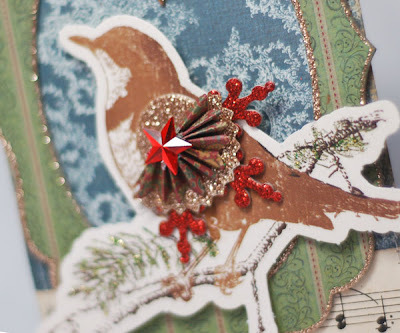 And I had to use some of my new favorite stuff - Jenni Bowlin crepe paper. 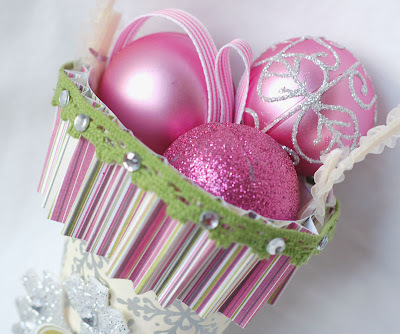 I have loved designing for Pink Paislee this year. Even though my time with them will be over at the end of the month, I know that I will continue to use their beautiful products. It's not too late to apply for the 2009 team. I HIGHLY recommend it. Check out the call here. 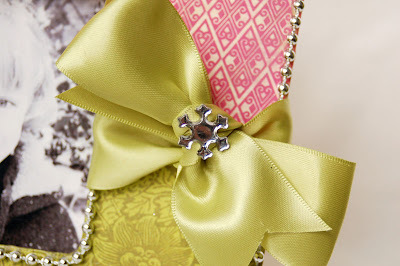 Finally, here is a peek at my next project for Emma's. Cindy is doing a giveaway for some $20 gift certificates. 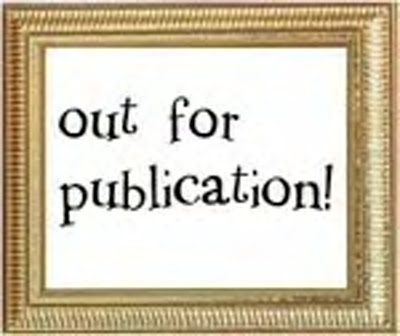 Just head over to the Emma's blog and leave a comment. She will be picking a winner and announcing it on the 15th. Good luck! That's it for today! Hope you have a great weekend! It is a yucky, rainy Wednesday here. But, at least it's warmed up a bit. We had a blast of artic air over the weekend and it was frigid. I'm not ready for that kind of weather yet!!! Today I have a couple of things to share. 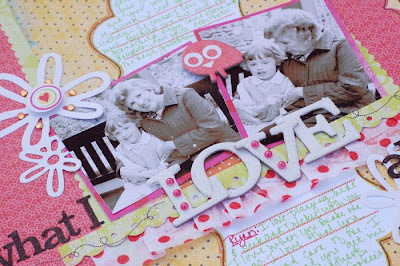 First, here is the sneak peek of my layout for this week on the MMM blog. The rest of the page can be found HERE. It's that busy time of year, so I thought I'd post something I created for Emma's. This is a set that would make a wonderful teacher or friendship gift. I love bath salts, salt scrubs and all kinds of shower gels. So, I thought it would be fun to try and make one. Here is a little set that I created using a recipe I found. 1. Combine all ingredients in a bowl and mix well; spoon in jar. 2. Add a bit to your hand or a bath mitt and rub all over. I halved the recipe and still had a bit left over. Also, I added some Castile soap to make it into a foaming scrub. You can cut down on the baby oil if you do this. To make your own scent, use the soybean oil and add a few drops of essential oils. Play around with it to find the consistency you like. 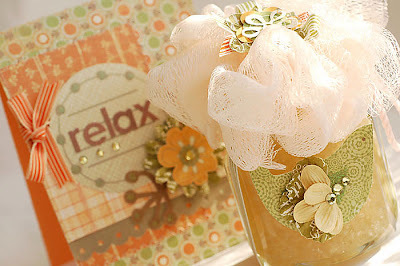 Tie a bath 'pouf' to the top of the jar and place in the gift bag. 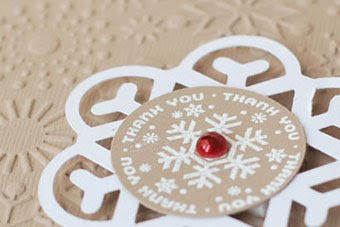 I used mostly Crate Paper papers and die cuts. 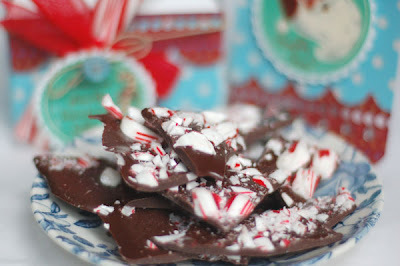 So, create this fun treat for yourself or for someone else. And take some time to relax this holiday season! I've been wondering how people get those cute backgrounds on their blogs. Well, I found the site today. I think the little ad pops up near my header. Since I'm a match, matchy girl, I love the idea of being able to change my backgrounds. So, I thought I'd play with this one for a while. Anyway, in keeping with the spirit of Christmas, I have a couple more of my window tin ornaments to share today. 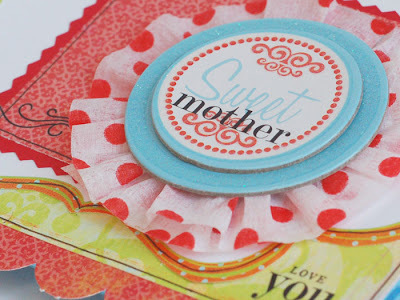 This first one uses a Crafty Secrets Vintage image on the inside. I traced it with Stickles. 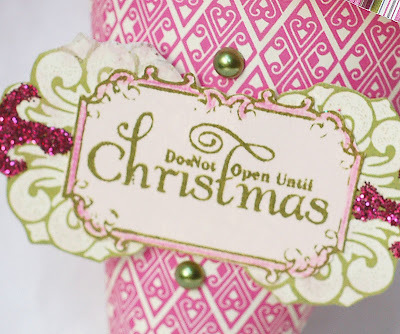 Then, I added glitter, felt and some chipboard on the outside. The little portcelain flowers were an RAK from Michelle from A Million Memories. Aren't they cute? It's official. I'm in the Christmas mood! We put our tree up this past weekend. We've made a gingerbread house. And I've gotten a lot of my shopping already finished. I think that starting early will help me enjoy the season more. I'm trying to spread the goodness out over the entire month. 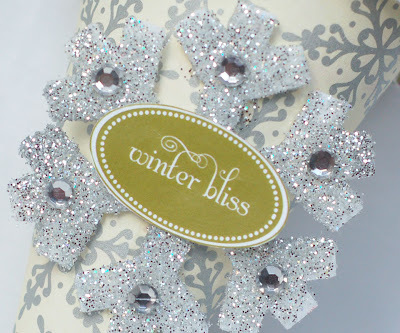 Speaking of enjoying the season, you need to check out a wonderful new blog. 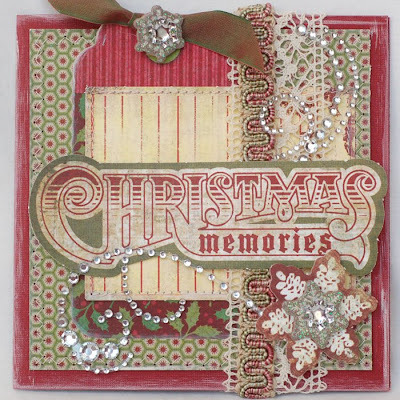 Cris Cunningham is hosting a Christmas blog and lots of people (including me ;)) will be contributing projects, layouts, cards and recipes that exemplify how to truly relish the spirit of the season. Oh, and normally I'm not a fan of blogs with music, but you'll have to put the speakers on for this one as she has some wonderful Christmas Carols playing in the background! So, onto some projects. This week's 2 Sketches 4 You sketch is so cute. 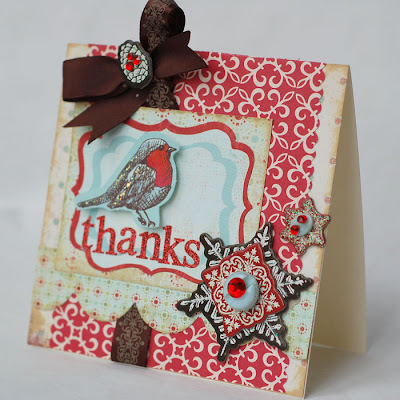 Love the DT'c cards, too. I played around with it for a while and ended up rotating the card 90 degrees to the right. I ended up with this card. 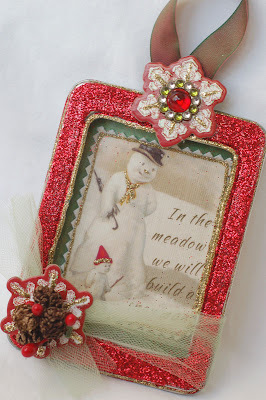 Yeah, I went a little crazy with the layering and jewels, but I love how it turned out. As you know, today is Tuesday. That means it's MMM blog day. 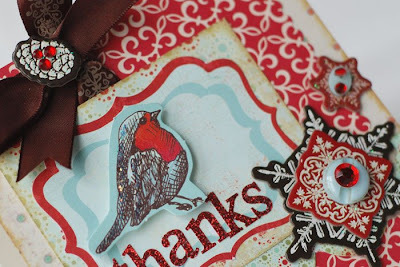 I have been playing around with the little tins my Paper Salon stamps came in. I reorganized my clear stamps this weekend and ended up with a lot of little tins that I didn't want to part with. So, I made some fun ornaments. 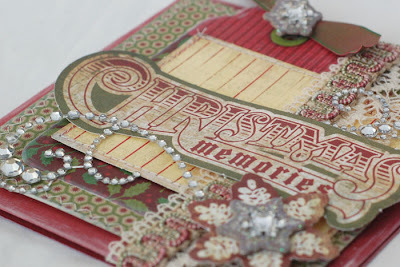 Here's the sneak peek of the one on the blog. I'm still feeling full from Thanksgiving dinner! My sister in law and niece hosted a wonderful celebration. We ate and ate and then ate some more. And the desserts...MMM!!! So, here are acouple of sweets that don't have ANY calories. Hee hee. This first card is one I did using Webster's. It uses one of my favorite quotes. I used some vintage sheet music on it and hand cut the flowers. 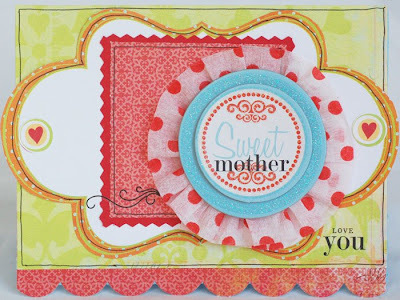 This next one uses the awesome Sweet Cakes line from Pink Paislee. I'm just in love with these colors! This card is based on the Bonus Sketch at 2S4Y. 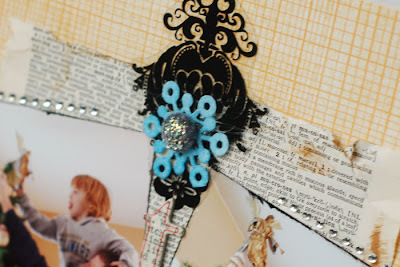 I added some Jenni Bowlin crepe paper ribbon behind the chipboard. I think this may be my new favorite stuff! Hope you're all doing something fun this weekend. We are heading out to make gingerbread houses with my girlfriend! I'm hoping to do a bit of Christmas decorating, too. Just a quick post to say Happy Thanksgiving! I hope that all of you U.S. girls have a joyous celebration today. May your time with family and friends be filled with happiness, gratitude and peace. Just wanted to share a couple of quick cards today. This is the card I did for this week's CPS sketch. 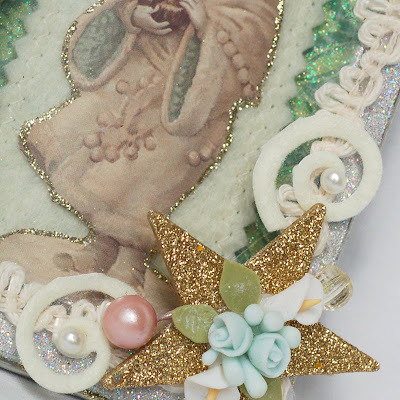 I used some My Mind's Eye papers, a Creative Imaginations transparency, some Prima flowers and jewels and a ribbon from my stash. 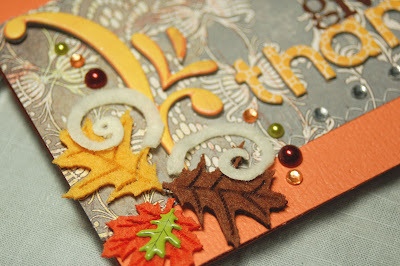 And what would Thanksgiving be without a Thanksgiving card. 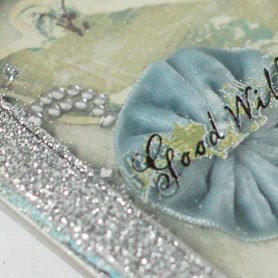 Here's one using lots of Queen and Company felt and pearls. Finally, I leave you with a quote that I found, of all places, in the comics section of the newspaper this week. I hope you are feeling as blessed for your treasures today as I am for mine. As you know, Tuesday is my MMM Blog day. This week I went a little crazy ( ;) ) and did a digital page. I love looking at all of the digi elements that are out there. I fell in love with these two kits and since I had some Fall photos to scrap, decided to give it a try. 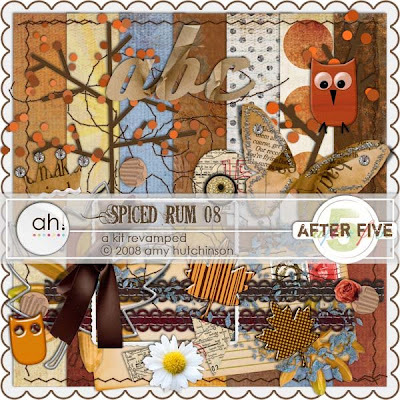 I got these kits at Amy Hutchinson's store After Five Designs. They have the cutest things there! This week's 2S4Y sketch is by Kazan and I just love it!! Here's my card. I had a hard time getting a picture of it this morning because it's so rainy here. But, you get the idea. It's a lot more sparkly IRL. 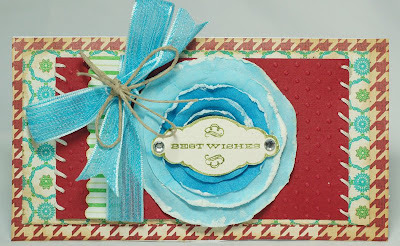 ;) I used K and Company paper and rubons,Hambly transparency, a Prima flower and brad, Doodlebug sugared brads and Basic Grey stamps.